Today I had to tackle a preschool storytime. I am not a particularly brave librarian, though. If I find a picture book that works, I have to really work at not using it over and over again in front of a crowd of two to four-year-olds every time I do a storytime. Kids are unafraid to inform you when you are boring the socks off of them. after all. So today I was brave and I used not one, not two, but THREE brand new picture books. It was scary, but it worked. And Pouch! by David Ezra Stein, was one of the three. Admittedly, I brought it out because I knew I wanted to review it, but it wasn't field tested (as it were) yet. Now I am happy to report that when read with the right amount of verve and near panic, this is a delightful storytime option that kids and adults alike will both love. Clearly the kangaroo word for "retreat" is "POUCH! "Joey's a sweet little baby kangaroo who one day gets a wild notion. "Mama," he says, "I want to hop!" Mama's willing, but little Joey is a bit of a panicky sort. On his first outing he runs across a bee. His reaction? "POUCH!" and in he hops. On his second hop about the woods he meets a rabbit. You can guess his reaction. Trip #3 and it's a bird that freaks him out. But on Trip #4 he meets another baby kangaroo. And after both of them give a cry of "POUCH!" they realize how silly they've been. So much so that when their mamas offer a pouch to them at the end, they confidently slap their arms around one another and say with pseudo-nonchalance, "No, thanks. "Stein has style. They say that when you write fiction you should have a distinctive voice. Well, Stein's distinctive voice is in his brush. You can see it in his previous titles like Monster Hug or Leaves and you can see it here. In this book he employs watercolors, china marker, and water-soluble crayons. This sort of makes it the kind of art where it looks childlike, but with obvious skill creating the linework. The colors gel together nicely too. From the warm brown/oranges of joey's fur and interior pouchworld to the green/blue sky and that shock of white that outlines the characters at key moments, everything here feels right. And pay attention to when Stein opts to do two-page spreads full of color (as when the two joeys meet for the first time) and when he uses a lot of white space (when they both scream "POUCH!" at the same time). The artist also hides characters in his seemingly simple illustrations. In one shot Joey takes five hopes to the pasture fence. Behind him, the bird and rabbit are hidden, but still in view. Pretty slick.I also love that the dialogue often, though not always, looks like it's been cut out of the background. The thick white letters have this magnificent hand drawn character to them (you can see it in the title on the cover). It just feels right. Like a kind of kangaroo-speak, maybe. Finally, check out those endpapers. You might miss them the first time around, but look close. Light orange silhouettes play against a yellow background. Those silhouettes turn out to be the animals that frightened little Joey before he met another of his kind.Joey is consistently afraid of other animals, but it's not as if they're practically threatening. Even the most benign rabbit or jovial bird is cause for panic. Joey's continual advance and retreat will be familiar to anyone who has watched a baby puppy or kitten approach another animal. Stein just gets that trepidation down pat. I love watching the little Joey's body language. You can tell that he's ready to back away at a moment's notice at all times. When he meets the bird his left foot is already raised, ready. Curiosity will win out in the end, but for a while anything that speaks is considered potentially dangerous. Until, of course, it becomes surprisingly familiar.Ultimately this is a story about coming out of your pouch. For little kids, it's pretty comforting. Mama is almost always nearby, open pouch waiting. The animals deemed scary couldn't be less so unless you slapped ridiculous eyelashes on them (not a suggestion). Stein is just one of those picture book author/illustrators that understands his readers. What he does is hard to do. Pouch! is just the latest example of this. It's a prepossessing little gem. Not big and showy. Just the kind of thing that works beautifully in front of big groups or as a cozy one-on-one bedtime book.Ages 3-7. The moment I opened this it turned into one of those "I wish I had this when Julia was a baby!" books. I absolutely adore the illustrations - so glad it was done the way this is and not in a different manner. The two parts of the book go great together and really add to each other instead of just "being there". I think every parent will be able to see their baby in little Joey. And I know I was able to think back and laugh at the times where Julia was very like Joey. It really brought up some great memories and it was great fun sharing them with her as well. The ending is just the best. Nothing else I can say - it's the best. The look on the joeys' faces is classic. And the mothers question is so, so relatable. I never thought I'd be relating to a kangaroo. :) This is great for any age also - from birth up to parents like me. Can't wait to check out more of the authors work. This is a really fun read aloud book if read with the right amount of verve. Some kids will find it hilarious.It’s a reassuring story about a young kangaroo (named Joey, a cute touch) who wants to hop, but also wants to return to the pouch, back and forth as he vacillates between his curiosity and his desire for some independence, and his struggles with his fears. Mama and her pouch are always there when Joey needs it. The ending is wonderful, and very insightful about how a child grows and develops, although perhaps a little bit bittersweet for mamas.I really enjoyed the illustrations. They’re funny, have a lot of content and it’s fun to look for some of the less clearly defined subjects, and they’re very attractive. We loved this. A very simple story, about a timid baby kangaroo, that I thought would be too young for my 6-year-old but I every time the joey yelled "pouch!" and dove back in (I didn't skimp on the drama in my reading) my son laughed his head off. The ending is very sweet. Very nearly a perfect book. A cute little book about Joey, a baby kangaroo who wants to explore his world but each time he meets something new he gets scared and wants to get back in mom's pouch. Then he meets another kangaroo, they both get scared and want their pouches until they realize how funny they are. Then they want nothing more than to hop around together. For when you need a book about how it feels when the world is a little scary but you still want to venture out.POUCH! This charming picture book has a great message about young children exploring the world around them, while still enjoying the safety and protection of a caring parent. When Joey was born, he spent all of his time in his mother's pouch. But now he's gotten big enough to stick his head out and look around. He wants to hop about, but each time he goes out he gets frightened and returns to the pouch. Young readers will appreciate being shy around new people and the joy of making a new friend. Warm, cheery watercolor illustrations help make this a great book to share with primary aged children at story time. This was a cute book about a Kangaroo who wanted in and out of her Pouch curious about what's on the outside. He went from animal to animal asking who they were and then wanted back in his mama's pouch until one day he realized he was ready to be out of the Pouch. Maybe he felt more secure in knowing the animals in his surroundings. This is great life lesson book. Children will adventure on their own when they are ready and the Kangaroo knew when it was time to adventure out into the world. Maybe he felt safer asking about different creatures. Satisfying a child's curiosity is the name of the game when children are little. The more they inquire the more they absorb and learn. So much fun to share in a library pre-school story time! Just two lines of text per page, lots of opportunity for shouting together the word POUCH! as little Joey says as he jumps back in after encountering new things, such as a bee, a rabbit, a bird, and another joey. Children name them for you if you pause. The performer can invite children to jump with Joey, first two times, then three times, then four times, and finally five times. In our case we let our hands jump off our laps so we could all remain seated. It can be a little scary for a joey to venture outside of the pouch for the first time. That's what happens to Joey in this story. He ventures out but each time he encounters a new animal, he yells "POUCH!" and takes off back to his momma. Until he encounters someone that looks like him! Adorable. A book about exploring new things, being afraid and making new friends who are just like you. Great for a movement/animals storytime! Get the kids hopping like kangaroos with this fun story about meeting new people. Great PreK read aloud, but goes will with K-2 students as well. Such a cute story and with the number of hops in the text, it makes for an easy sequencing lesson for PK & K.
We loved the author's Dinosaur Kisses so much we got this book and love it! I think it is auntie's favorite of the two. Toddler nephew loves it too! Got this for a five-year old's birthday and I sure hope he likes it! I thought it was cute. The safest place in the world is Momma's pouch. I think everyone's natural instinct is to hop back to the pouch and curl up in safety inside when we feel scared or threatened, to return to a place we've known as safe since day one of our existence. Venturing out into the world, even just one extra hop at a time, can be frightening, but as long as we have that pouch to jump back to, everything kind of feels like it will be fine. A secure home base is the mooring for all contented adventuring. Shortly after Joey is born, he lets his mother kangaroo know he wants to hop. There's a lot to see outside the pouch he has lived in since birth: experiences to be had, people to meet, places to bounce as he explores down the road on his own. But timidity creeps in on Joey the first time he runs across another living being in the outside world, a bee. And it's a hasty retreat back into the pouch for Joey, nervous at what this unusual flying insect might be like and how it will react to him. Joey is happy to snuggle inside his mother's warm, protective pouch for a while longer, but one can't be happy sitting idly forever. Out he comes to hop again, moving another pace further down the road before a second creature, a rabbit, sends Joey frantically bounding back home to his pouch. Joey repeats this process several times, always making it one more hop from Momma before meeting another animal that sends him scurrying to safety. A life free of the pouch seems glamorous, in theory, but what about the great big world that lives out there? That world can be scary for a little Joey whose heart flutters in fear at the sight of anything strange or unexpected. But then Joey makes one last hopping excursion, and finds a creature unlike any so far, one that just may be as fearful of Joey as he is of it. Imagine, an animal actually being nervous around Joey! Could it be true? But Joey knows there's nothing frightening about himself...how could someone else not know? Maybe Joey has found a friend, after all; and in that friend, a good enough reason to brave his own fears and keep him out of the pouch for a while. When you meet up with a heart as shy, uncertain and sensitive as your own, it just might be the basis for a great friendship. And you'll be surprised to realize, over time, that neither of you have felt the need to go hopping back and hide in your pouches. Pouch! sincerely and insightfully addresses issues of fear and how it inhibits our ability to feel comfortable out in the world, but does so in such an endearing way that it never feels like a book about fear. Traumas small or large can be enough to send anyone trembling back into their pouch, shutting their eyes against a world that sometimes seems so bright and inviting, so full of beauty and laughter and friendship and truth, yet can turn so scary without any warning at all. It feels, at times, as if the safest and best course of action is to stay in the pouch permanently and never chance getting out, never lay a foot upon the ground that could trip you or suddenly sink beneath your weight. And it may be safer that way, but it definitely isn't better. No matter what we fear is waiting outside, real or imagined, major or minor, every joey has to leave his pouch eventually if he wants to go anywhere. The rewards might be just as satisfying as what Joey finds in Pouch! when he ventures away from his mother...but we won't know for sure until we gather the courage to hop away and explore. May we all find some happiness beyond our pouch.David Ezra Stein's illustrations are simple yet beautiful, especially in the two-page spreads we get every once in a while in Pouch!. The illustrations are so sweet, too, that one can't help being touched by them. It's easy to form a relational attachment to Joey and want him to find what he seeks on his forays outside of his home. The charm of David Ezra Stein's storytelling and artwork are both considerable. I would give this book two and a half stars, but it was a fairly easy decision to round that rating up instead of down. Star ratings and personal criteria for deciding them may change over time, but what surely won't change is my fondness for Pouch!. I will always have a special liking for Joey and his story because of how much I identify with them. A book about being brave. I asked the children I was reading to what the animal was that he was encountering each time. A fun read. Pouch! by David Ezra Stein is a fun, repetitive story that young kids will love. It's all about a baby kangaroo who has lived his entire life in a pouch, but then he peaked out and saw the world. "Mama," said Joey, "I want to hop!" He takes one hop and meets a bee. Frightened, he yells "Pouch!" and hides. His curiosity gets the best of him and he keeps trying to hop. He meets several animals but continuously gets scared and hides. Then, he meets another baby kangaroo. Both frightened marsupials yell "Pouch! ", but then begin to laugh at one another. They instantly became friends and hopped everywhere. At the end the mother offers her pouch. "Pouch?" "No thank," Joey replies. Stein also did the illustrations. They seem a little sloppy but intentionally so. The characters aren't necessarily realistic. They are more cartoon like. Stein used many browns, greens, and yellows in the book. He did a wonderful job of showing scared Joey storming back to his mother's pouch. This book is a great read-aloud and a pretty easy read for the younger ones. You can also use the book to introduce animals that kids usually don't see, such as the kangaroo. Children in preschool to 2nd grade will like this book. Pouch is a book about a baby kangaroo branching out from his momma and seeing the world. At first, the baby kangaroo wanted to hop and when he took a couple of hops, he ran into a bee. That scared little kangaroo, Joey. So he yelled "Pouch!" back to momma. He did this several times until he ran into another baby kangaroo. First running in to the other kangaroo, he was scared and then he found out the other one was too. So the two kangaroos were giggling and happy. They no longer needed to be back in the pouch.This story is probably one that I would read to a kindergarten classroom on the first day of school to show that it's okay to be scared but they don't have to be. The students could then bond and form friendships. I liked this story because of that concept, alone. It would be an enjoyable read aloud. The illustrations are also rather nice due to the facial expressions on little Joey's face with every animal he meets. This story tells the tale of a baby kangaroo, Joey, who begins to meet new friends. Each time he encounters another animal, he jumps right back into his mom’s pouch because he is scared. Eventually, he meets another baby kangaroo. This time things are different and Joey asks his new friend if he is afraid too. The two kangaroos realize that they don’t have to be afraid of meeting new people. They decide to become friends and don’t have to jump back into their mom’s pouches. This book can be used to talk about meeting new friends and new people. It could be read on the first day of school in which children may want to run back to their parents because they are scared. Children can take time during this book to identify why they want to be friends with other children in the class (e.g. “he likes cars”) or what makes them good friends (e.g. “I can share.”). The book is simple with repetitive language, making it easy to understand for all learners. Joey was a little kangaroo, but there was a little issue. Joey had a desire to go out into the world. Gradually Joey was able to hop out of his mamas pouch farther and farther. Every time Joey jumped out he ran into something he did not know of and back into his mamas pouch he went Pouch! But Joey is not the only kangaroo with a desire to explore the word.While reading Pouch! I noticed a pattern. Every time Joey jumped out of his mothers pouch he jumped farther and farther. He starts off with two jumps, then goes three, and finally four until he's unites with another kangaroo that is also afraid like himself. This book made me laugh when I saw that Joey was afraid of the smallest and harmless animals Pouch! he yelled and jumped back into his mother pouch. I can't quite determine the moral of the story but I believe in a way a defines a mother in the form that she will always be there until her child is ready to take on the world. As I was reading this, I kept thinking of my friend's son. He would play with you for a little while, but then he'd have to check in with Mom, as if reassuring himself she was still there. So while I agree with some of the other Good Readers that this would be a good storyteller pick, as a bookseller, I would have recommended it to a parent with a kid who's suffering from separation anxiety. The book seems to say, it's okay to be a little scared and to want to stay close, but there's a world out there filled with new things to explore! The illustrations are watercolors and seem a little sloppy, but, in my opinion, they look like a child did them, reinforcing the idea that this narrative is from one child to another. I also liked the fact that the bee, bunny, and bird made cameo appearances in the background of some of the later illustrations. 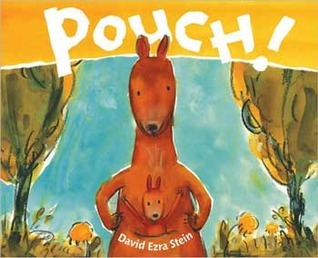 "Pouch" by David Ezra Stein is the perfect children's picture book for any child who's facing going out into the world for the first time and leaving the safety of home. Centered around Joey, a baby kangaroo, and his tentative forays into the forest that leads him to meet other species, the part of the book I loved the most was the way he persisted through his fears and kept leaving his mother's pouch to continue exploring. Illustrated with "china marker, watercolors, and water-soluble crayons" the artwork is as compelling as the text. Amusing and challenging enough for repeated reading "Pouch" is an agreeable tale both children will like hearing over and over and readers will enjoy sharing. I loved this, but my five year old son-- though he giggled at it-- says it was scary. (?Huh?) Baby Joey comes out of his mom's pouch, and encounters another animal. "Who are you?" "Bee". "POUCH!" yells Joey, and hops back in the pouch. This pattern is repeated about five times, until he meets another baby kangaroo and, as they both turn around and holler "Pouch!" they realize that the other is as scared of them. Then they become friends. This is typical toddler behavior, and the pictures are charming. I think toddlers and early preschoolers (who could recognize their former selves with amusement) would enjoy it. David Ezra Stein - David Ezra Stein is an author-illustrator whose previous books include LEAVES, winner of an Ezra Jack Keats New Writer Award. He lives in Kew Gardens, New York.